Keep your neighbors in mind with your fence plans! Are you planning on investing in a new fence around the perimeter of your property? 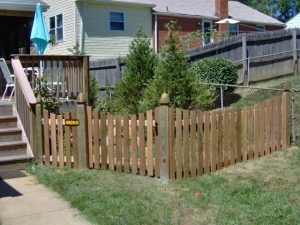 It is important to remain conscious of your neighbors with all of your fence plans. Your new fence is likely going to have a significant impact on them. All too often, next door neighbors get into arguments over fence-related disagreements. With that said, here are some fence etiquette tips to always keep in mind! Although you don’t necessarily need to do this, it is a good idea to consult your neighbors with your neighbors with all of your fence intentions. Even if they do not agree with your fence decision, it is a neighborly thing to do to let them know ahead of time. This way they can at least plan for it and aren’t shocked when one day they look out their backroom window and see contractors hard at work. In the case of many fences, one side of the fence is better than the other. If one side of the fence is less attractive, you should not have it facing your neighbor’s property. This is unfair to your neighbor because it will take away from the appearance of their yard. Whenever you are in doubt, you are better off asking to avoid issues with your next door neighbors. A common issue that homeowners have with their next-door neighbors is overhanging tree branches. Not only can tree branches present a safety hazard, but they can also easily cause damage to a fence. Many homeowners are unclear of what tree branches they are permitted to trim. To avoid any issues, it is a good idea to consult your neighbor ahead of time. This also applies to any fence cleaning as well!